In fact, if you have a respectable amount of room in your backyard and partner with a skilled interior designer who can help keep costs in check, you can create a beautiful and functional outdoor kitchen for your Kansas City home. Just one more requirement: it helps to love to cook and entertain outdoors, where food always seem to taste heartier and drinks seem more refreshing. Devise an outdoor floor plan that integrates seamlessly with the traffic pattern of your home. In fact, the spot where you currently grill might be the ideal spot for a larger, workhorse grill. A designer can help you ensure that the outdoor floor plan affords plenty of room for cooking, congregating and eating. Capitalize on every inch of available space you have, looking for opportunities to creatively enhance the space. For example, the backsplash of an outdoor counter can be raised so that it doubles as bar seating. Part of a double sink can be converted into a beverage cooler with an easy-open top. Use only water-proof appliances and products – yes, they do exist. Consider including a grill, oven, sink, refrigerator, beverage cooler, ice maker and, of course, cabinets. Built for the outdoors, they’re designed to sustain the harshest outdoor elements. 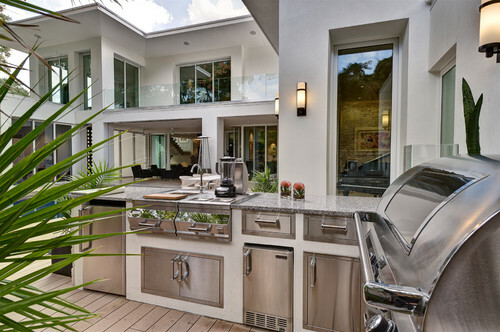 For help designing a beautiful and functional outdoor kitchen, contact Interiors by Melody.